Haha, I do my homework on the first day each module now I’m out of jobs to do and just working on my own projects! I lack motivation when I don’t have a dead line, hope a freelance gig starts soon! This week I have concept art to paint! I’m very slow and I’m just trying to tackle it one later of detail at a time. I think it’s coming out alright here’s my update! It’s due next week so that’s when all my final shiny details will be in there! Heading out today to do some biking with my girlfriend, then I think I’m gonna poke around with an old model of a biker I had to work on for class. I See if I can’t make that into a really good Zbrush sculpt. Wanna push my clothing detail to the next level now. Well.. 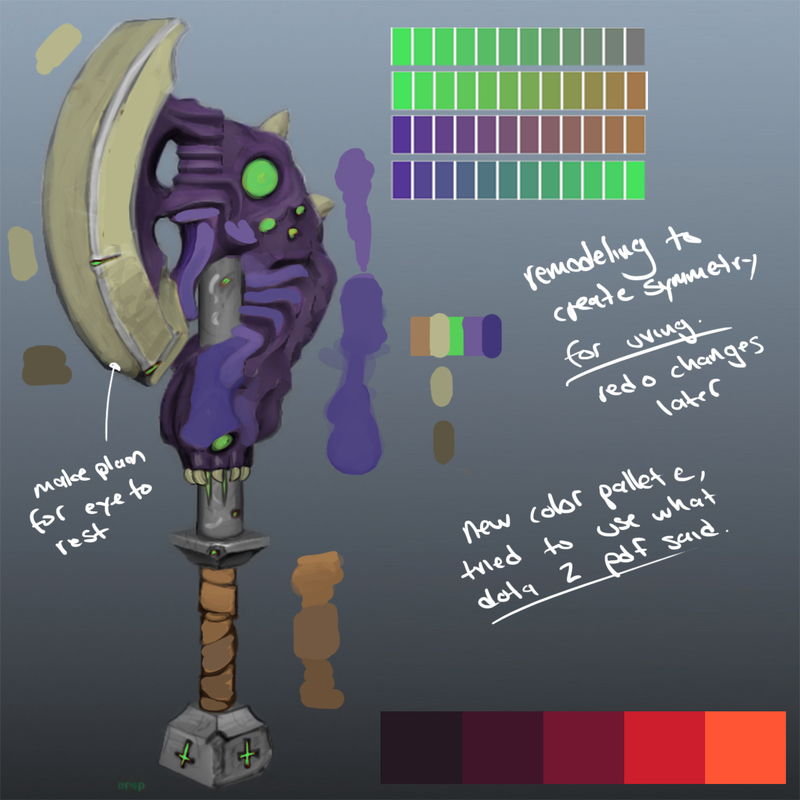 I learned a bit about color palettes’s for video games and how to not overload a user today, had some really helpful pdfs from dota 2 about character creation for a specific purpose. I use a lot of the same techniques but nowhere near to the extent that they are. 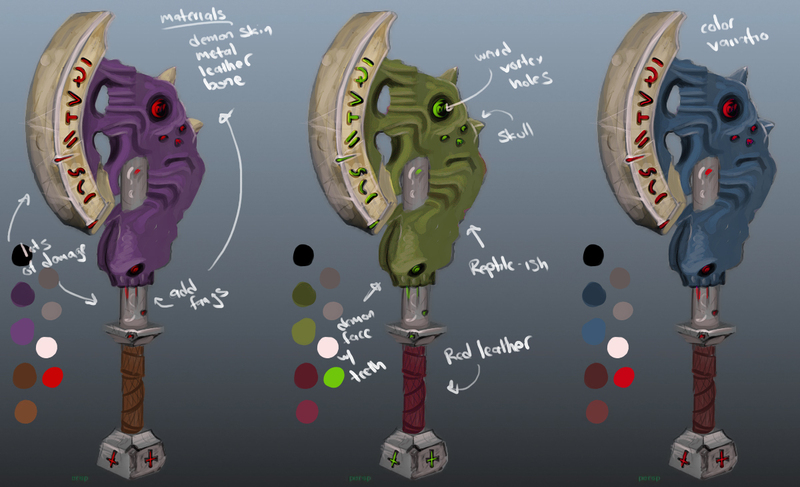 Here’s my updated concept art, that will be fully rendered in a week. For this update, I created a less busy blade so the user has a place to rest his eye when things get too busy. I created gradients going from the bottom up to help ground each piece, I changed the color of the glow to be tertiary to my purple on the color wheel and the brown is also a blended tertiary color. Week two! Well, it’s time for my second week of classes. I just finished a few big freelance gigs and one small one for a client so I have some good amount of extra time to spend on school today! I’m hoping to do at least one speed sculpt of faces today so we’ll see how that goes I suppose! Maybe it’s time to start thinking about my demo reel? 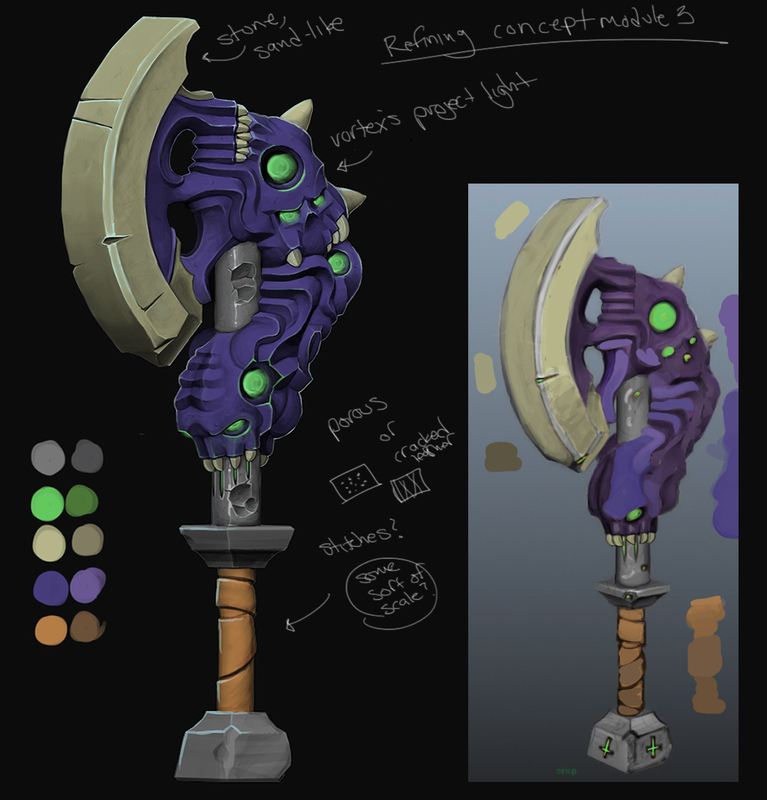 Today I had to do some concept art on top of an existing low poly model. Here’s my color ideas! Well… I don’t exactly need to go buy new clothes and impress anyone with my dashing good looks today like I did in high school! First day of summer classes today, I can never figure out why schools waste the first 2-3 weeks with joke work before we get into serious stuff. Maybe that would make sense when people don’t understand what it takes to get good grades but I’m in a masters program now! Lets get into this!! Well, about to finish up all the work for this contract I’m working on right now. Really stoked about the pieces I hope I can show them eventually!! UFC UFC UFC! Gotta love free fight nights, way easier on the wallet! Well I’m sculpting on this big project that has a 2 week deadline and it’s still goin awesome! Not sure when I can show anything but I’m really stoked for it! Even bigger projects are on the horizon so that’s cool too! Cheers. Back to sculpting I go!